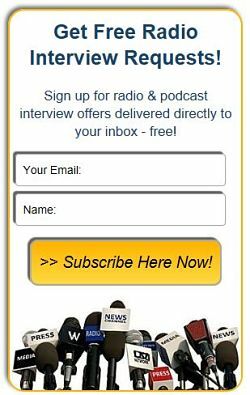 Podcast & Radio Guest Request Confirmation - Radio Guest List.com - How to Get Radio Interviews and Find Podcast Guests! Thanks for completing our Podcast & Radio Guest Request submission form. Your Guest Request will be processed for publishing to our worldwide audience on RadioGuestList.com in the next 3-10 business days. Will you please support our service as much as we support your show? If our FREE radio and podcast guest finding service has helped you and your show, would you consider a quick donation? It takes a lot of time and work for Scott, Kara, Barb, and Anmarie to keep this service running for you FREE. Say thank you by making our next Happy Hour that much happier! If you're a repeat user of our Free service, maybe you'd like to thank the team for their years of work helping you build your show and audience? Every one of them needs to eat at least daily, so a free lunch is a great way to say thank you for helping you build your show! With all the guests we provide your show so easily for FREE, we save you TONS of time each month. Maybe in return you'll share $10/month to support our work for your show and broadcasters everywhere? Cancel anytime. Still a great bargain! If you'd like to support us but none of those amounts feels quite right, we invite you to use the easy "Send Money" feature on PayPal to email a contribution of ANY AMOUNT to us at info @ radioguestlist.com. We'd sure appreciate it very much! Visit Paypal here to "Send Money"
We're working hard to help YOU so we appreciate anything you would like to share to support our free service! ALSO, WILL YOU PLEASE SHARE YOUR GUEST REQUEST? Watch our website and your inbox for your Guest Request to go live. Your sharing helps us both: The more you share your Guest Request on Facebook, Twitter, Google+, Instagram, your blog, or elsewhere online, the better guests you'll get for your show! Thanks for using (and sharing!) our free service. Just started my own podcast, "Safety Talk" after being a guest on over 40 shows in the last 20 months or so. In just the first post requesting guests, I have booked 8 so far! Great service for both guests and hosts/PR firms. Thanks so much for what you do! I'll have to buy a round for your office! Stay safe! Radio Guest List is an absolutely wonderful service. I have received your newsletters for years now. The My Future Business Show has interviewed dozens of high quality guests via Radio Guest List. I have used this before, and I want to say, just awesome.